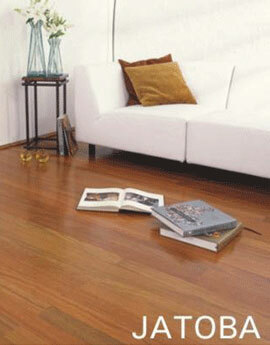 Our specialist range of tropical hardwoods – all certified by the FSC – add a special atmosphere to your room. The Jatoba floor boards have tongue and groove on all four sides and come with factory applied coats of lacquer to ensure your enjoyment is very long lasting. Elegance, hard wearing, exoticism and most of all natural colours are the benefits that come with our flooring – all of it without harming the environment. The dimensions are: 19mm thick ,127mm wide and up to 1.22m long in random length flooring boards.